3D Printer startup Venturi 3D LLC, announced that they have launched their much anticipated Kickstarter campaign on Tuesday, July 31st 2018. With an early bird price of $999, the fully assembled 3D printer boasts several unique features never seen before, including an enclosed 4 color/multi-material setup and 1,000 Ready-to-print models pre-installed. This is the planned first step toward offering hundreds of ready-to-print models available every month. The models are organized into 10 categories, including Education, Tools, Toys, Art and Music. The built-in 7" android touchscreen serves as the graphic interface to preview your model and choose which filament colors or types you want to print with. "We believe the consumer market has stagnated with cheap kits, potentially unsafe wiring and exposed hot surfaces. Beyond that, they have a very high learning curve to use. We've set out to radically re-define what a 3D printer can do and finally push the industry in a new direction," stated Christopher Lane, the founder of Venturi 3D. "Our goal is to allow anyone to be able to push a button and print beautiful, useful objects." With a focus on design aesthetic, the Venturi 3D Printer has the look and feel of a high-end appliance. It also includes hardware from top parts manufacturers including DuetWifi, E3D, BondTech, Olsson Ruby and BuildTak. 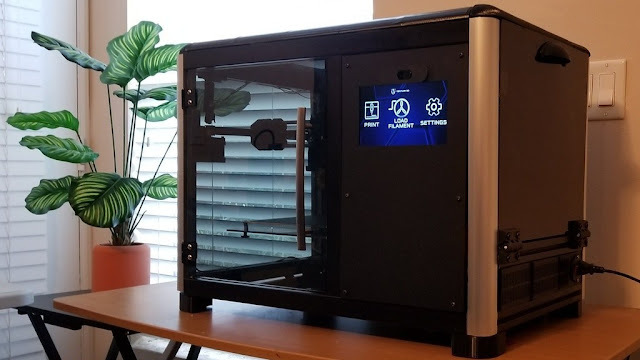 The printer is fully enclosed so it is optimized for printing many types of materials and safe around children and pets. The hardware is just the basis for what Venturi 3D is offering. Until now, 3D printers have required the user to either create their own model using a CAD program, or try to find a model online and then "slicing" the model. The slicing process involves checking over a dozen settings before printing and often requires trial and error. Venturi 3D is utilizing an entirely unique approach by creating a lab testing environment. This will allow the team to do the curating, slicing and testing of all models in advance. The lab will use the top CAD and 3D model slicing programs (including AutoCAD, Fusion 360, Cura, Slic3r and IdeaMaker) to ensure only the best quality models every time. Material combinations will also be tested here, and a print farm of 50 printers will serve as both hardware quality control and model testing area. "This lab environment allows for so much more potential than what currently exists in the market, where most users only have their own testing and methodology to refer to. Our research could lead to helping other manufacturers as we try to push the industry forward," added Christopher. Another key difference is that filament supplied by partner companies will have a QR code that updates settings to an on-board SQL database. This database handles all of the model information and settings. The database updates automatically from those inputs, and is designed to make the user experience as seamless and simple as possible. Any fears about a closed-source ecosystem are eased, as the Venturi 3D printer is fully open source and open filament. This means that it can be used the same way as most other 3D printers on the market. The printer is also designed and built in the U.S.A. to ensure quality control and direct oversight of the assembly process.